Why hire Pics Photo Booth instead of a traditional photo booth rental company? Pics Photo Booth is unlike your traditional photo booth rental. Our open air, mobile photo booth staffed by energetic photographers, is sure to impress and engage even your most reserved guests. Your event deserves personalized attention, and we’ll make your guests feel like super stars! Pics Photo Booth will be there to engage your guests, and we’ll ensure that each photo booth style photo is picture perfect. Your guests will return home with a meaningful and lasting keepsake from your event. To customize your look, we will work with you to coordinate the backdrop, theatrical props and photo frame overlays to complement your party’s theme and color scheme. Because of the absence of walls around an actual “photo booth” there’s no crowding into a confined space. We encourage group shots – after all, the more, the merrier! Get your guests’ creative juices flowing outside the photo booth? Feel the energy from more dynamic and creative poses. Every individual in the picture will receive a copy of the print – each produced in less than eight seconds! What makes you different from other “photo booth” companies? 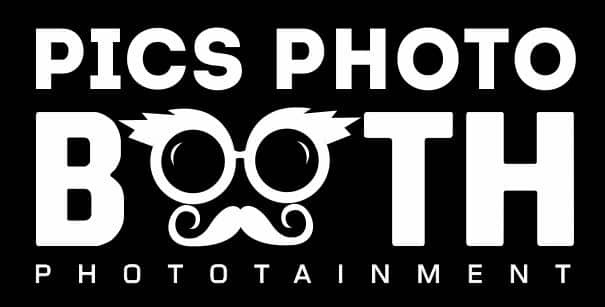 At Pics Photo Booth, we specialize in on-location photo shoots and we’re dedicated to providing customer service unmatched by any Area photo booth company! Pics Photo Booth offers personalized service and an interactive experience for your guests. At Pics Photo Booth, we will cater to any event. We can coordinate complex or more conventional shots depending on your preference. Our photographers will give your guests artistic direction and suggest the most flattering poses for their photos. We’ll encourage guests to incorporate theatrical props into their photo booth poses to create exciting, unique and lively shots. Additionally, at Pics Photo Booth, we use superior quality equipment that’s a step above the technology available from a traditional photo booth rental. Our state-of-the-art SLR camera, studio lighting, and dye sublimation printer will produce amazing, high-resolution 4×6 photos! For what would typically be spent on party favors, our service is an incredible entertainment experience. Guests will enjoy endless opportunities to interact with family and friends. At the conclusion of your event, images will be uploaded to our digital gallery for sharing and social networking. We also offer packages that include a photo guest book and scrapbook supplies. How does the Pics Photo Booth concept work? Your guests will be invited to pose in our open air photo booth area. Our photographers have a keen eye for great pictures we’ll use top-of-the-line equipment to snap up to four photos of each of your guests. Guests will be able to choose from an assortment of props to use during their photo booth session. Props for your event can be tailored to fit your event’s theme. With our state of the art photography equipment, we can accommodate large groups and small children too. Our amazing photo booth photographers will coach and engage each person or group to ensure that each picture is worth more than a thousand words! Each of the 4×6 prints with your pre-selected custom photo frame overlay will be available in less than eight seconds. What a great way to enhance your party’s theme and capitalize on a branding opportunity! Everyone in the picture will receive a copy of the photo booth photo – what a cool party favor! We will also have the digital images uploaded to our website upon the conclusion of the event. Upon request, we also have the capability of producing a memory album complete with photos and personal notes for the party’s host. Pics Photo Booth will entirely manage this process. We will also have your party on our website, and the pictures shared via social networking sites and email. How many photos will each of my guests receive from Pics “photo booth?” Each of your guests has unlimited access to the photo booth area, and they’ll receive up to four pictures on a 2*6 strip each. Your GROUP can pose for up to four shots. Watermarked, digital images will be uploaded to our website upon the conclusion of the event. Your guests will have complimentary access to the files that they are welcome to print, email or share on social networking sites. How much does your photo booth rental service cost? Please give us the opportunity to discuss your photo booth rental requirements with you personally. We offer a variety of photo booth packages in addition to å la carte pricing that will provide you with the best value. Just fill out the form on our Home Page, or call us and we’ll get your Pics photo booth party started!! I need to select a photo booth rental company for our corporation’s meeting and party. How can I enhance my company’s image and branding? Pics Photo Booth offers a variety of options that will coordinate with your party’s theme. Digitally produced custom frames for your photo booth event photos were available in endless color themes. We can also incorporate logos and images into the overlays to enhance your brand or personal identity. Also available are fully customizable backdrops. The use of theatrical props included in photo booth set. Just tell us what your requirements are, and we’ll give you our recommendations! Can I obtain digital files of the photo booth photos? The high-resolution image data will be uploaded after the event and hosted for your viewing pleasure for a year. Feel free to produce additional prints on your own, or share the photo booth photos on your favorite social media sites. At Pics Photo Booth, we take special care to ensure that every photo booth rental experience and picture we take is a moment you’ll want to treasure forever! Roaming Photographer: $250 (Add a roaming photographer to take candid’s,) possibly a few formal photos, group shots, etc.) The roaming photographer is not full time but randomly shoots/works the photo booth itself. DJ/MC/VJ Terry Tunks and his talented team of entertainers have entertained at any thousands of events over the years. Evansville, Indiana, Newburgh, Indiana, Owensboro, KY and all across Southern Indiana and Kentucky. In towns like, JASPER, FERDINAND, FRENCH LICK, WEST BADEN, NEW HARMONY, HUNTINGBURG, NEW HARMONY, AND SANTA CLAUS, IN. Based at one time in Louisville, KY As a result of sponsorship of Coca – Cola. SPECTRUM SOUND has been just as comfortable entertaining small groups at a casual affair to 18,000 at the THUNDER OVER LOUISVILLE DERBY CELEBRATION.